Delphi lies 180 kilometers northwest of Athens to which it is connected by a regular bus service. Although there are enough things to do here to justify an overnight excursion, you can easily make Delphi a day trip from Athens. A convenient way to do this is to join a full-day tour to Delphi from Athens that includes direct transportation by bus or van. Or you can stay overnight, either in the little town of Delphi, close to the ruins, or the mountain village of Arachova, a few kilometers from the ancient site. The Sacred Way is the main route through the Sanctuary of Apollo, leading from the gateway uphill 200 meters to the Temple of Apollo. Originally, it was lined with votive monuments and treasuries erected by various Greek cities, reflecting the diversity of the political pattern of ancient Greece. The monuments themselves have disappeared, but many of their bases have survived. The Treasury of the Athenians (built around 510 BC and re-erected 1903-06) is in the form of a Doric temple. It was built by the Athenians, using marble from the island of Paros, to house their offerings to Apollo. It is decorated with a fine frieze. What you see is a copy; the original is in the Delphi Museum. A flight of steps leads up to the theater. Dating from the fourth century BC, with later alterations during the Roman period, the theater could accommodate 5,000 spectators on 35 rows of stone benches. 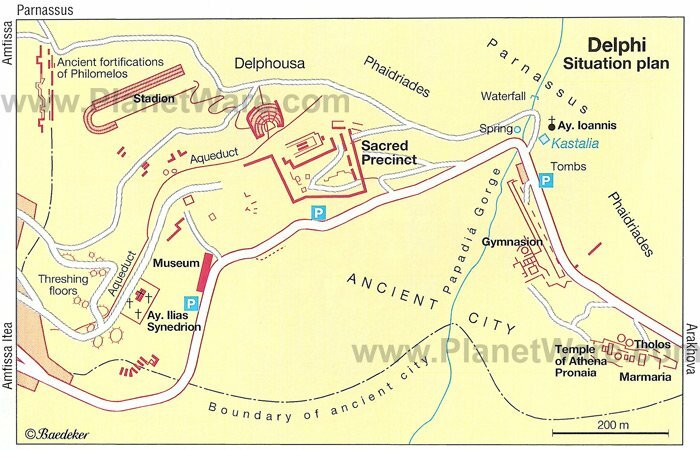 It was built to host musical contests at the Pythian Games, which were held at Delphi from 590 BC onwards. 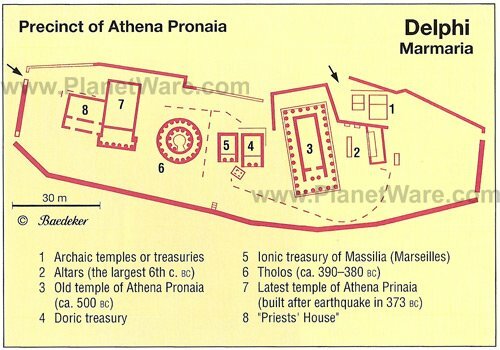 Lying within the sacred precinct, it commands fine views of the entire site. The Stadion, which lies at the highest part of the site, 50 meters above the theater, was built in the fifth century BC but gained its present appearance under the Romans in the second century AD. Its tiered stone seating could accommodate 500 spectators. Like the theater, it was built to host the Pythian Games, staged at Delphi from 590 BC onwards; athletic contests would have been held here. The present little town of Delphi (population 2,300) is now a concentration of hotels, guest houses, restaurants, shops, and attractions catering to tourists. It was established in 1892, when the village of Kastrí, which had grown up on the site of the Temple of Apollo, was moved to a new position one kilometer west to allow excavation of the ancient site. This is a good base for exploring the surrounding area. The Delphi area offers plenty of scope for mountain walks and winter sports, mainly on Mount Parnassus (Parnassos), which rises 2,457 meters, making it one of the highest mountains in Greece. Snow-covered in winter, Parnassus is home to the country's largest ski center, with 27 kilometers of ski runs. In winter, wealthy Athenians like to visit the mountain village of Arachova (population 800), on the north slopes of Mount Parnassus, a few kilometers east of Delphi. Old stone buildings house old-fashioned hotels and guest houses with traditional decor, and small romantic taverns serve local specialties such as hilopites (a type of pasta) and formaéla (cheese served grilled). The village is known for the fluffy flokati rugs made there, which you'll find in shops all over town. Tours to Delphi from Athens: Enjoy the Greek landscape while someone else drives your air-conditioned coach direct from your Athens hotel on a 10-hour Delphi Day Trip from Athens. The tour includes transportation and a guided tour through the archaeological site, as well as time to explore the Delphi museum on your own and a stop for shopping in the village of Arachova. Getting to Delphi on Your Own: The bus from Athens takes about three hours each way; driving takes somewhat less time. There is plenty of overnight accommodation in Delphi and nearby Arachova, which has more character. 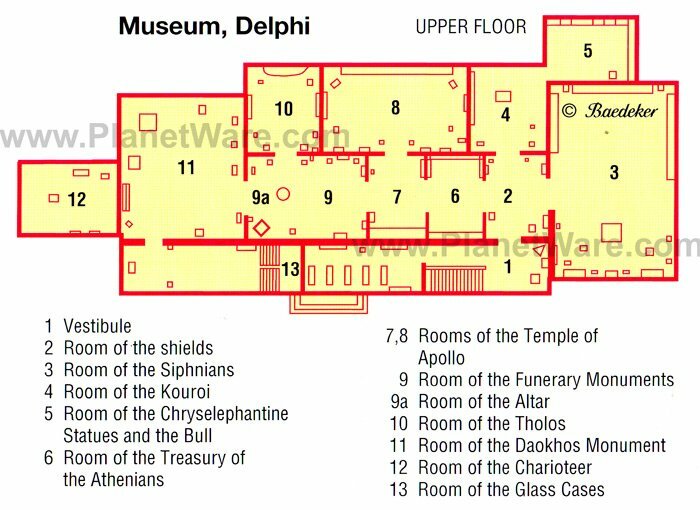 Comfort and Safety: Because visiting Delphi requires a lot of walking on hilly terrain with rough stones underfoot, wear sturdy, comfortable low-heeled shoes. Especially in the summer, when the midday sun is very hot, wear a hat and be sure to carry enough water. You might want to bring a picnic lunch to enjoy in a scenic spot among the ruins.